On your diet, that is. But….that’s not really my point, plus I’m drooling on my keyboard. My point is that I love ice cream and that I notice its absence acutely. In spite of this – or rather, because of this – I gave it up for OktoberFast…..totally not thinking about my friend’s birthday being in October. Traditionally, what do we have for birthday celebrations? Cake and ice cream! Yes! So, when discussing his birthday dinner, we agreed that I could take a “time out” just for that one night. After all, it was just one night. And it was his birthday, for pity’s sake! Right. It was still cheating. I made a commitment to myself at the beginning of October that I would keep the sinks clear of dishes and that I would not eat ice cream. Neither commitment really matters to anyone else but me; so, who really cares if I lapse? No, not lapse. Cheat. We were celebrating. That’s a good reason to have something special, right? Sure. It’s as good an excuse as any to cheat. So is having a bad day, having a good day, or Thursday. There’s always an excuse to cheat if you look for one. I’ve regained 80 of the pounds I lost six years ago with just that kind of thinking. “I can have it just this once.” But it wasn’t just once, was it? That one cheat day became a cheat weekend, then a cheat month, then fat pants with elastic waistbands. It’s just like several of the times I quit smoking. I would go for months and even a couple of years without a cigarette. Then I would be with a group of smokers and I would think that I could have just one. BAM! I’d soon be back up to a pack a day on regular days and over two packs a day on the weekends. The truth I had to face was that I couldn’t have just one. I was (and still am, I suppose) a nicotine addict. One hit of that Camel Light and I was hooked again. Intellectually, I know that my body responds to all addictive substances in basically the same way – the pleasure centers of my brain go nuts. And my brain doesn’t really care if the cause is a cupcake or a crack pipe. It just knows that it’s getting something it likes and it wants more of it. Ultimately, my addiction isn’t to ice cream. It’s to sugar and to casein, the protein in milk that, when broken down during digestion, releases opiates called casomorphins. To be fair, there is some debate on how much of an effect casomorphins have on the human body; however, sugar is still there so my issue remains. In the end, I have to break my addiction to sugar by drastically reducing my intake of refined and added sugars. Ice cream is just the first step. And, just so you know, I bought the container pictured above for my friend to enjoy ice cream with his cake while I limited myself to cake. Hey, it was chocolate ganache and I never claimed to be a saint. I obeyed the letter of the law. Obeying the spirit of the law will come later when I’m a little stronger. As for OktoberFast? I’m still faithful and going strong. Twice this year I have helped move other people. As I packed their belongings, sometimes I wondered why they kept some of the things they did. Sometimes, I wondered, but only sometimes since that kind of question leads to uncomfortable introspection in my experience; so, mostly, I just kept my mouth shut and packed. At the best of times, I am not a great housekeeper. Knick-knacks give dust a place to settle. Knick-knacks also create an obstacle course for dusting, making an unpleasant task even more unpleasant. So, I rarely do it. The cooling temperatures motivated me to do a some Fall cleaning this weekend which has lead to a little introspection on why I keep so many things. I have books that I bought 10 years ago intending to read. I still haven’t read them. My guess at this point is that I’m not going to. I have bowls that belonged to my grandmother. She used them daily. They have been in the back of my cabinet for 12 years. I have two 32″ CRT television sets. One hasn’t been turned on since December. The only has been dark for 5 years. I have enough mismatched wine glasses to have 30 people over for cocktails and canapes. I don’t even know 30 people I’d want to have over for cocktails and canapes! I have shelving units and storage furniture that does nothing but store things I don’t use – things are weighing me down. They are cluttering my space, making it harder for me to keep an orderly home that feels good to be in. So, I started boxing things up, listing them for sale and giving them away. It gave me a stomach ache. Can you believe that?! I actually felt physically ill when I delivered a reproduction ice box to a woman who wanted it. I felt panicked putting books into a box to go to the library. How silly is that? Every item I identified as useless, the hoarder in my soul identified as something with priceless memories attached. “You can’t get rid of that book on felting with cat hair! Think of all the projects you are going to make with that!” I felt like a child with a toy I’ve long ignored until someone else wanted to play with it. Suddenly, it was the Most Important Toy Ever. Organization experts say to keep only those things that make you happy. Get rid of things that you are keeping out of guilt or habit. Keep useful things that contribute to your positive sense of well-being. As I sorted through things to keep, my Inner Hoarder said that everything makes me happy – in fact, I might need a few more things! My Inner Hoarder talks too much, contributes nothing to the bills, and won’t dust for love or money. So, I have these useless things all around me, clogging my space, draining my energy, hiding dust that makes my nose stuffy and, still, I am reluctant to give them up. I know that it is wasteful for me to keep them when someone else can actually use them; but, still, I hesitate. I know that I will feel better physically if I get rid of the dust that hides in all these extra books and knick-knacks, and yet……. They are familiar. They are tradition. And I don’t like change even when it’s good for me. From the looks of all the storage facilities lining the highways, I’m not the only one. See those flowers? I bought them as a treat for myself. Normally, I eat my emotions. 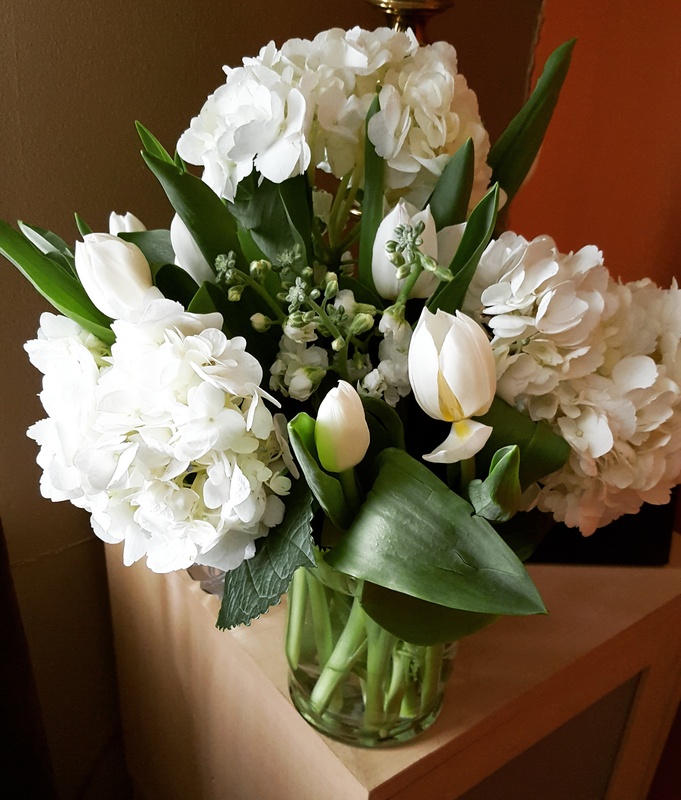 This weekend was kind of a tough one and I didn’t want to dive into the Ben and Jerry’s; so, I bought the flowers to lift my spirit. If looking at them doesn’t work, I’ll be having them with ranch dressing later. In the wee hours of Saturday morning, a friend stepped outside of his home to smoke a cigar. Five men he didn’t know were standing there. He suggested that they leave. They shot him twice. My friend is a retired Air Force officer and pilot. He is a war veteran. He is a bona fide American hero and these thugs shot him. He is hurting and has quite a bit of rehab to do; but, he should recover just fine. He’ll have no income and a ton of hospital bills because those jackasses; but, he should recover. Saturday afternoon, I began to smell death around my house. By Sunday morning, it was unmistakable. My sister went under the house and found one of my feral kitties – Blu – had curled up in an area the ferals use as a den in bad weather, and died. Blu had been missing a couple of weeks ago. He was limping when he reappeared; however, because he did not allow touching, I had no way to know how badly he was injured. After showing up for three mealtimes, he disappeared again. As I said, my sister found and buried him Sunday morning. Sunday lunch was spent with a friend who has metastasized breast cancer. She has one of the greatest survival stories I’ve ever heard. To escape childhood sexual abuse, she literally ran away and joined the circus – well, carnival. She traveled with the carnival and it saved her life. She hasn’t had an easy time of it by anyone’s measure; but, she is a kind woman with an amazing spirit. She’s dealt with some pretty horrible things in her life and here she has another one. Injury, death and illness. It was an awful lot of mortality for this empath to handle in 24 hours. My mind is awhirl with thoughts of love and motivation. As a professor, Robert Pirsig (author of Zen and the Art of Motorcycle Maintenance) literally drove himself insane trying to define the idea of quality. I’ve felt a little bit like that today trying to define the idea of love and divine the motivations behind our love for people and things. I can easily tell you why I love my son – he’s funny, with a kind soul. He’s nobody’s fool and knows how to draw boundaries for himself. He’s intelligent, curious and articulate. But, I didn’t know that he was any of those things the night when, as an infant of only maybe three months old, he began fretting in his sleep. His diaper had leaked, leaving his pajamas and sheets wet. Now, the truth is that he was so little, I could have changed his diaper and his clothes, put him at the dry end of the crib and he’d have been fine. But. I didn’t do that. I changed his sheets, too, so that his whole area would be clean, dry and comfortable for the rest of the night. Why? Because I loved him. I didn’t really even know him; but, I loved him. I had chosen to make that Love commitment to him, plus there was all the biology going on encouraging me to nurture him, ensuring the continuation of the species. I say that like it’s a given, don’t I, that mothers will love and care for their babies? But we know that’s not always true. It wasn’t true in ancient Rome where brothel babies were routinely killed and disposed off in the sewage system and it’s not true now when babies are killed and hidden under couches. The Love commitment -or perhaps, I could more accurately call it the urge to nurture doesn’t always happen. I’m less interested in why it doesn’t occur than in why it does. The loss of something we love hurts. We know that it’s going to hurt long before it does. Most of us have a biological imperative to mate. We are compelled to find a partner. Many of us are also compelled to reproduce. The species wants to continue; so, we many of us are programmed to have and care for babies. I can objectively understand the biological urge to do those things that overrides any desire to avoid the pain of losing that mate or a child. But what about friends and pets? Why do we risk that pain? Why do we choose to love? Brew up some coffee or steep some tea tomorrow morning and we’ll talk some more about it.